If you’re looking to buy a foreclosure property, a foreclosure auction should be your first stop. When lenders take over properties, foreclosure auctions are your first, and often only, chance to buy the property—but don’t assume getting a deal is a standard practice. To make sure you’re getting the best price, you’ll have to do your homework first. Start by learning the laws and rules. Laws covering foreclosure sales vary by state. Once you know how your state handles auctions, look into foreclosure buying. Foreclosures are sold “as-is,” and new owners often have to make repairs and improvements to the property. If you know people who have bought foreclosures, ask them about their experience. Observe an auction before you bid. Attend one or two local auctions. By observing the bidding procedure, you will learn what to expect when you are ready to bid. The U.S. Department of Housing and Urban Development lists foreclosure properties on its website. Mortgage lenders have lists of properties with defaulted mortgages. 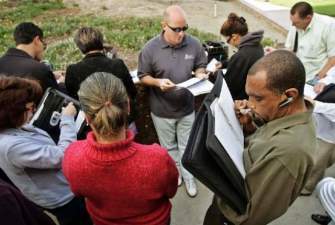 Local courthouses and newspapers have postings about foreclosure auctions. Do a title search, which will tell you whether there are any other mortgages on, or liens against, the property. Visually inspect the property. Usually, you cannot inspect the interiors of foreclosures before the auction, but try to determine the home’s condition based on the appearance of the exterior and the yard. Speak to a Realtor® about prices of similar homes in the neighborhood to determine a fair sale price. Research recent local sales online or through county records to get a sense of current prices. Choose a price you can afford, but one that’s high enough to gain the notice of the bank selling the property. Contact the auction trustee listed on the foreclosure notice and ask about the minimum bid the bank will accept. Usually, the bank will seek to cover the amount of the unpaid mortgage, which might be above current market value of the home. Ask your Realtor for advice on what to offer. Research current real estate prices so your offer will be within acceptable range. Come prepared to counter other bids at the sale. Have a final number in mind; it should represent the maximum amount you are willing to pay. Avoid getting caught up in the excitement of the auction, and don’t allow yourself to offer more than that final number. If your bid is selected, you will have to provide a down payment and pay for the home shortly after. Make sure to bring cash or a cashier’s check to the auction for the down payment and to secure financing to cover the rest of the purchase before you bid.